Happy Friday, friends! Hope you have all had a great week and are looking forward to a fun weekend. Instead of doing a regular old outfit post today, I thought it might be fun to share some pretty flat lays I featured on Instagram recently to inspire your weekend style. Scroll down to see each look and check out the SHOP THE LOOK section below the photos to get outfit details! This button-cuff sweater is under $80 and such a pretty everyday piece! A classic you’ll wear with everything from leather skirts to distressed denim. It’s a very warm knit and also comes in black and scarlet! This sweater is such a cute style steal for fall/winter. I’m also loving the texture this velvet bag is giving to all of my favorite outfits, dressy or casual! It’s such a gorgeous neutral for the season, and the gold hardware makes the whole look pop! If you’re looking for a cute date night look or girl’s night outfit, look no further. This tee is so comfortable and also comes in black and grey. The puff sleeve detail takes it up a notch and elevates it to statement staple status. A great work to weekend staple, don’t you think? Throw on a leather jacket or cozy cardigan if the temps are chillier than t-shirt weather! I also just picked up this new bag, inspired by my bestie Meghan Markle – or at least I wish she were my bestie. The midi tote style is such a great size for work or weekend, and it comes with an optional crossbody strap. So useful! 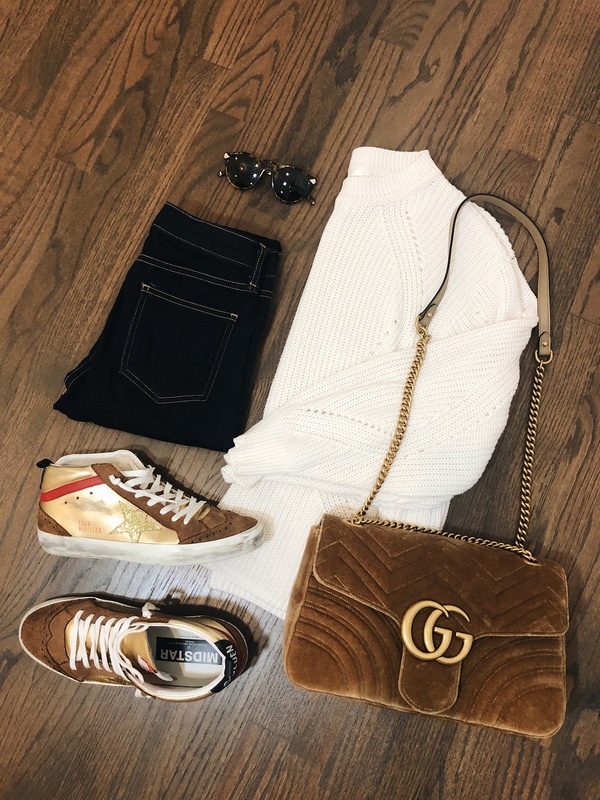 I have been absolutely loving my Golden Goose sneakers! They are incredibly comfortable and so easy to slip on and off – aka, perfect for travel. I’ve worn them with dresses and jeans alike, and they look super cute with both! Obsessed. This sweater is actually from HM last year, and I got it for under $50! Such a fab price point. A few other similar sweaters I’m loving from the fast fashion brand include this, this and this.